I have a foolproof recipe for the BEST turkey you will EVER taste! I promise! Follow this step-by-step recipe and your guests will be talking about your turkey for years to come! It will go down in history! Unfortunately, I didn’t get a good “Cooked and plated shot” because it was such a mad rush for food, and the sun had already gone down, so I had to use the dreaded FLASH. 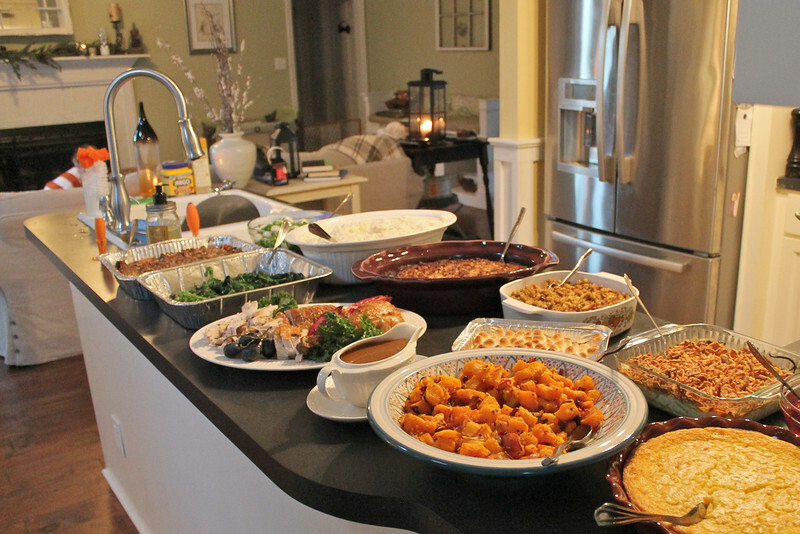 But here’s a picture of the spread. 1. Place butter, herbs, and garlic in the bowl of a standing mixer. Mix until well combined. Put in an airtight container in the fridge. 2. Make the brine. Cool in fridge COMPLETELY. Once cool, remove turkey neck, giblets, etc. and put turkey into the brine, breast side first. Cover with foil and put in the fridge. 3. Cut celery, carrots, onion, lemon and put into a gallon sized ziplock bag in the fridge. 4. Take herb butter out of the fridge and leave on the counter overnight to come to room temperature. 5. Preheat oven to 500F. Remove turkey from the brine. Discard brine. Rinse turkey with cold water and dry COMPLETELY with paper towels. Place on roasting pan. 6. Stuff cavity with the lemon and half the bag of carrots, celery, and onions. Place the rest of the veggies in the bottom of the roasting pan. 7. Carefully separate skin from the breasts and rub the butter under the skin on each breast. Use the skin to move the butter around to get it into all the nooks and crannies. Then, rub butter on top of the legs. 8. Fit foil “breastplate”. This foil will protect the breast from burning. Once the foil is fitted, set aside. 9. Use a paper towel to rub a thin layer of canola oil on the outside of the whole turkey. Sprinkle with salt and pepper. 10. Bake turkey for exactly 30 minutes at 500F to brown the skin. 11. Lower temperature to 350F. 12. Take turkey out, insert digital thermometer into the thickest part of the BREAST (smack in the middle between wish bone and outside of breast) and set thermometer to 155F (about another 2 hours). Place foil breastplate on and put back in the oven. NO BASTING! You want a crispy skin. 13. 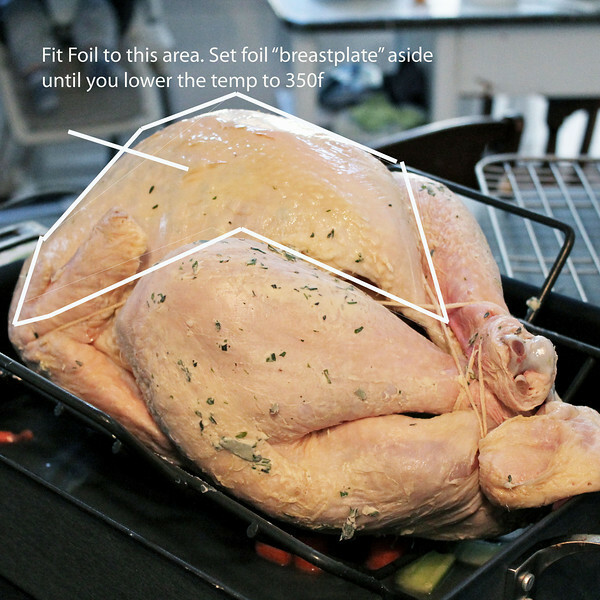 When thermometer beeps, take turkey out and cover with a foil tent. Let rest for AT LEAST an hour before cutting. Keep thermometer in. The temp should come to 160F while resting. That is your goal temperature for a DONE bird! 14. Cut both breasts off and set aside under foil tent. 15. Stick thermometer into thickest part of the thigh and put carcass and thighs back into the oven at 350F until thermometer beeps. This ensures that the dark meat cooks without overcooking the white meat. 16. To make the gravy, place the roasting pan, full of the delicious drippings, on the stove over medium-low heat. Whisk in 2 cartons of chicken broth and two envelopes of Knorr Gravy mix. Simmer and whisk until it thickens. Taste for seasoning. Add salt and pepper if needed. Run through a strainer. Keep warm in a pot on the stove or pour into serving dish if eating immediately. **Keep turkey under foil until the last second to keep warm. 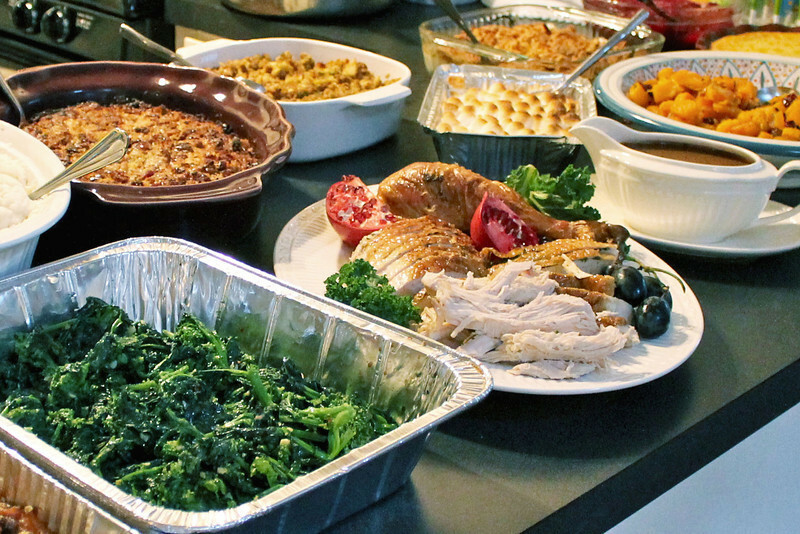 To reheat when guests arrive, place in a shallow baking dish and moisten with HOT chicken broth. Carve and plate with beautiful garnishes like pomegranates, citrus fruit, kale, or grapes. ENJOY!